The skin loses its elasticity and our muscles slacken with age. For the eyelids this results in an accumulation of loose skin which collects as folds in the upper lids and forms deepening creases in the lower lids. At the same time there is slackening of the muscle beneath the skin allowing the fat, which cushions the eyes in their sockets, to protrude forward to give the appearance of bagginess. In some families there is an inherited tendency for bags to develop during early adulthood before any skin changes. People who have the familial problem of bags beneath the eyes may well undergo surgery in their 20’s. Ageing effects of the skin are apparent earlier in the eyelids than elsewhere. A reduction of the skin can be carried out from the age of 35. Patients with thyroid disease often develop eye signs which can be helped by surgery. It is important for you to understand that only the wrinkles which are in the skin which is cut away will be removed. We are only treating the eyelids within the bony margin of the orbit (eye sockets). Folds of skin extending on to the cheek (festoons) will not normally be improved. Wrinkles in the area of the crow’s feet will remain and although the skin is much tighter it is still necessary to be able to open and close the eyes freely. Sometimes residual or recurrent wrinkles are suitable for treatment by botox or laser resurfacing. The operation has no effect at all on any dark colour of the lower eyelid. Both upper and lower eyelid surgery can be carried out under local anaesthesia or under general anaesthesia in a hospital. In a typical procedure the surgeon makes incisions following the natural lines of your eyelids; in the creases of upper lids and just below the lashes in the lower lids (see illustration). These incisions are extended a little way into the crow’s feet or laughter lines at the corner of the eyes. Through this incision surplus fat is removed and excess skin and sagging muscle removed. If you have a pocket of fat beneath your lower eyelids without surplus skin then the fat may be removed through the inside of the lower eyelid The resurfacing laser can be used at the same time as a transconjunctival blepharoplasty to tighten the external skin and reduce wrinkles, although there is no external scar there is residual redness in the skin which will last a few months. The sutures are usually removed after 3 to 5 days and soon after you will be able to use make-up. Sometimes you will be advised to use the suture strips or steri-strips as support to the lower eyelids for a week or so. The closure of the eyes appears tight after surgery because of the swelling and because skin has been removed. If closure is not complete at night the patient should apply some eye ointment before going to sleep. This sensation will settle as the swelling goes down. All surgery carries some uncertainty and risk. 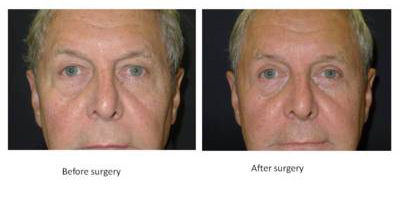 When eyelid surgery is performed by a qualified Plastic Surgeon complications are infrequent and usually minor. You can reduce the risks by closely following your surgeon’s instructions both before and after surgery. You should tell him of any thyroid disease, high blood pressure, diabetes or eye disorder such as detached retina or glaucoma. It may be that he/she will wish you to be checked by an Ophthalmologist. Occasionally a pool of blood can collect under the skin after the operation has finished (haematoma) this usually disperses spontaneously over 2 or 3 weeks but it may need to be drained if it is large. Quite commonly the margin of the lower lid is slightly pulled away from the eye during the first day or two after surgery due to swelling. This will settle on its own or with the help of suture strips or steri-strips. Very occasionally another operation is necessary. Occassionally the eys have some difficulty closing particularly at night. In this case liquid tears or visco-tears may be required for a fe weeks. Sometimes tiny white cysts can appear along the stitch line. They are nothing to be concerned about but can be pricked out with a needle. Blindness is an exceptionally rare complication, alsmost always asccociated with preexistent bleeding problems.